If social media existed when Kate Moss started, God knows which turn here career would've taken. And using an unflattering picture with an unflattering lighting is a bit too easy and hypocritical. I believe Devon in this one, I watched the show and I think she did not mean no harm when she said what she said. Yeah Devon didn’t mean any harm because she’s obviously not smart enough to put the connection together. I saw the clip and what struck me most was Devon rudely trying to minimise the Asian girl's serious statement! That annoyed me more than her actual comment. That she was completely unable to sense that this was a serious discussion. What I've found is that when you're in a position of privilege, as I've personally encountered countless times due to my gender, race, nationality, socioeconomic status or whatever, you shut up and listen when someone from a disadvantaged group air their views. Devon however didn't event pause for a moment to process what the girls said. I always hear people say 'oh the youth of today and tomorrow will be more progressive in thought when it comes to diversity', but I really doubt it. Here you have a girl who's work environment at any given point would entail people of different creed, gender and whatnot, yet she still believes having to speak 'Paris' and getting the luxury of being morphed into the much revered 'thin, white and blonde' archetype, and subsequently reaping those benefits, is a struggle. EstefaniaAbaddon, dsamg, Armani and 5 others like this. I found Devon's comments just mind boggling. Like come on Dev, read the room?! She should be ashamed of that. I don't want to defend her in anyway but, years of analysing partially scripted reality shows means there's a fair chance that the scene we saw could be out of sequence to the actual events and very selectively edited. Still, there's no excuse for that level of insensitivity. Regarding Gemma Ward's comment on Kaia, i think that's totally coming from a good place, but just not expressed on the right forum. Gemma is probably one of the few people in the world who could understand the level of pressure, scrutiny and work of being a teenage supermodel, even Cindy was well into adulthood when she reached that level of success. I'm sure now Gemma's re-entering the industry as a grown woman and a mother, she's much more likely to speak up for what she believes in. Morgane07, EstefaniaAbaddon, Armani and 5 others like this. That's clearly Devon's PR team writing that apology because most of those words have more than one syllable! I REALLY REALLY want her career to be over, but I'm afraid this exposure might even help her. kenndale and modela like this. Gemma probably said that because she can relate with a girl who started so young in the industry. She is concern about it. Devon sounds completely tone def here. I think if she had ambassadorial contracts with big companies, it might affect her more since they could get skittish from the backlash and publicly drop her, but because she's more of a freelancer, she can probably just weather it unscathed, and like you said, enjoy the exposure from the mainstream media. It's not only influencers there this time. You have well known models, openly "feminists" and "activists" walking this show. Karen Elson closed it. This is some major f***fest of hypocrisy right there. Some of the models are just eager status hunters and I'm not one bit surprised to see them there. But Karen? I won't even refer Ashley Graham because I always thought she was only looking at her own agenda. I'm very disappointed. JessRubik, gunsnroses, mathiaskatz and 2 others like this. I was too, as I saw all the famous names parade down that runway. Most I never really cared for. Ashley was one of them, but Isabella Rossellini is a disappointment for me. Huge one, because I really admire her. The biggest danger about D&G is that their kind of behaviour will ultimately be normalised. I was appalled when Alexandra Shulman remarked in her memoir something to the effect of 'despite Stefano often riling people up with his outlandish views, he was still a nice guy and that she very much enjoyed their company and shows.' It just sounded so....diminishing. I imagine this is very much the murky sentiment for all these women and their relentless effort to push for 'feminism.' Same goes for Naomi, Karlie Kloss, and now Ashley. The irony is that the latter names are actually the first to start waving flags. Money talks! JessRubik, mathiaskatz and EstefaniaAbaddon like this. I agree in that there is a bit of hypocrisy in "feminist" and "activist" models walking for Dolce and Gabbana but this is the high end fashion world where values and morals aren't really a motivating factor for people. The fashion world and the people working in it don't owe a morally-driven values set. It's driven by profit making and high end commercialism. Full stop. So the hypocrisy is there but I don't really see it more than a mere blimp on the radar for models and individuals in the fashion world. Can anyone explain to me the issue with D&G? Any context, articles? Echoing billiejbob a bit, I think it all comes back to this myth that models can be super discerning in the jobs they choose in the same way as actors choosing scripts. Even the super supermodels we consider icons have little job security and sometimes little financial security, and they probably do disagree with Stefano, but are hardly in any position to pass up the opportunity to participate in a high profile show for the sake of their own careers and the exposure they need. 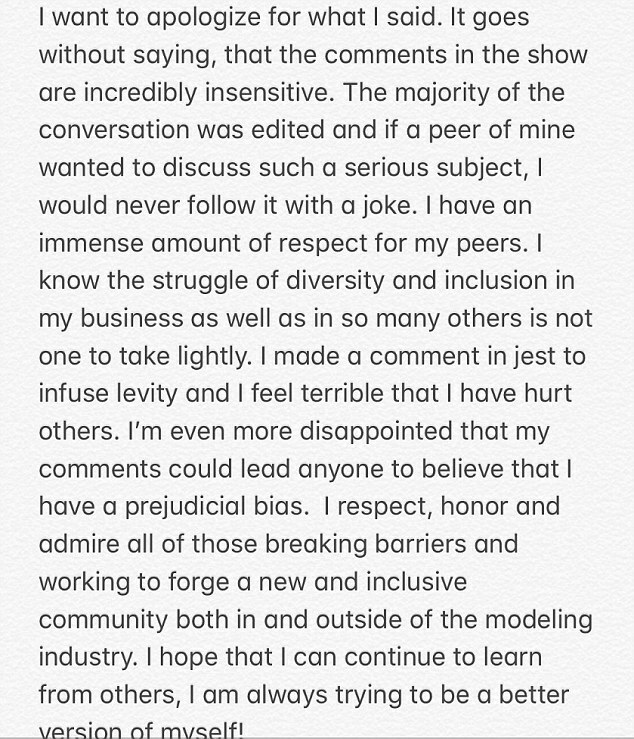 Because realistically it's putting your career on the line, and what model, no matter how famous, would dare publicly come out against such a plum client? You are right about that. If big magazines still support Dolce & Gabbana out of fear of losing advertisement money, how can we expect models to boycott a show? aracic, orchidee, mikel and 1 other person like this. AnnKateBetty and zacatecas570 like this. It's just been Stefano who's been wildin out, right? I wonder if Domenico's silence means he co-signs whatever his partner is doing or if he really wants him to stfu.